Former Union Minister and author Manish Tewari launched “What Marx Left Unsaid”, authored by Malay Chaudhuri, Arindam Chaudhuri and Che Kabir Chaudhuri at the India International Centre in New Delhi. It was launched to commemorate the 200th birth anniversary of Karl Marx. 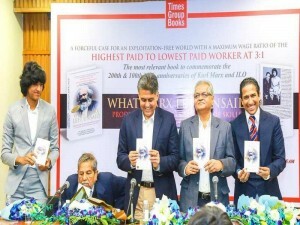 The book is jointly written by three generations of authors from the same family, and has been published by Times Group Books.